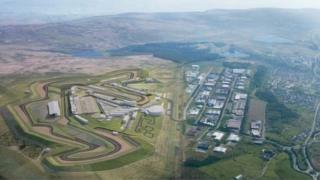 The firm behind a failed plan to build a £433m race track in Blaenau Gwent has lost the rights to hold the MotoGP. Circuit of Wales signed a 10-year deal three years ago to hold the motorbike race at its proposed track in Rassau, Ebbw Vale. But in June the Welsh Government refused to provide £210m of taxpayer-funded guarantees on the project. Circuit of Wales said the decision by MotoGP organisers Dorna to end its relationship was "understandable". Circuit of Wales: What next for Ebbw Vale? The three-day MotoGP has been held at Silverstone for the past three years and the race track will host this year's event from August 25 to 27. In a statement, Circuit of Wales said: "The decision taken by Dorna is completely understandable given the current circumstances surrounding the Circuit of Wales development and the Welsh Government decision not to underwrite part of the private sector investment. "At a time when the government is openly discussing bringing new events to Wales it is frustrating to think that an event with the power and scale of the British Motorcycle Grand Prix will not be taking place in the principality in the immediate future." It added: "The team's objective has been to grow the sport in the UK and deliver to Wales a stand-out world championship event in the years to come."